This Information Sheet provides information on Topic 3: Conducting Climate Change Vulnerability Assessments. In the previous two topics of this module you would have been provided with a more detailed introduction to climate change and how different types of climate change modeling processes are conducted. In this topic, we will focus on the methodology for conducting a climate change vulnerability assessment. Impacts of climate change on different sectors, including agriculture, biodiversity, health, infrastructure, and water. A vulnerability assessment lets you identify these adverse impacts of climate change that are most important to your area. The first step in a Climate Change Vulnerability Assessment is to develop a set of indicators. Indicators are a list of potential impacts that may take place in your area as a result of climate change. A draft list of climate change indicators have been developed for the RVCC programme. The indicators have been grouped into sectors and are listed below. The purpose of this list of indicators is to provide a starting point for the Vulnerability Assessment. Please add, subtract and edit the indicators as you see fit for your particular area. 1 Change in grain (maize and wheat) production Increased temperatures and changes in rainfall are likely to result in a significant decline in major crops of maize and wheat especially in the foothills and lowlands. 2 Change in Sorghum production Increased temperatures and changes in rainfall are likely to result in a decline in sorghum production. However, sorghum is a drought resistant crop and can tolerate erratic rainfall. 5 Change in other crop production areas (e.g. vegetables, nuts, etc.) Increased temperatures and changes in rainfall are likely to result in a significant decline in major crops of beans and peas especially in the foothills and lowlands. Other crops such as vegetables and nuts may also be affected. 8 Increased risks to livestock Projected decreases in rainfall and hence herbage yields would result in negative health impacts for livestock. 9 Reduced food security Reduced food security, particularly of subsistence farmers, and resultant increased malnutrition. 11 Loss of Grassland Biome Grassland Biome to be replaced by the Savanna Biome under a high risk scenario. 12 Increased impacts on threatened ecosystems Loss of threatened ecosystems due to changes in climate. 13 Increased impacts on environment due to land-use change Loss of biodiversity and degradation of natural habitat due to significant land-use change (such as alien invasion, soil erosion, urbanisation etc.) which impacts on the ability to respond to climate change. 15 Health impacts from increased storm events Increased storms (including snowstorms, heavy rainfall and lightning) will result in increased risk of injuries, drowning and population displacement impacts. 16 Increased heat stress Increases in average temperatures and extreme events (such as heat waves) are projected to induce heat stress, increase morbidity, and result in respiratory and cardiovascular diseases. 17 Increased vector-borne diseases from spread of mosquitoes, ticks, sandflies, and blackflies Vector-borne diseases are projected to spread within regions bordering current vector borne areas, which are presently too cold for transmission. 18 Increased water-borne and communicable diseases (e.g. typhoid fever, cholera and hepatitis) Favourable conditions for the incubation and transmission of water-borne diseases may be created by increasing air and water temperatures. 19 Increased malnutrition and hunger as a result of food insecurity Climate Change will affect food systems, compromising food availability, access and utilisation, leading to food insecurity (particularly of subsistence farmers). 20 Increased air pollution Health impacts resulting from exposure to air pollutants, especially in dry conditions, include eye irritation, acute respiratory infection, chronic respiratory diseases and TB, and sometimes death. 21 Increased Occupational health problems Temperature is a common climatic factor that affects occupational health (for example, agricultural labourer’s productivity) by causing heat stress and dehydration. 22 Loss of industrial and labour productivity Direct impacts of weather on construction, electricity generation and other industries, resulting in loss of productivity. 23 Increased impacts on strategic infrastructure Increased disruptions to key strategic infrastructure (e.g. Wastewater Treatment Works, stormwater systems, roads, rail, bridges, etc.) as a result of extreme weather events. 24 Increased impacts on traditional and informal dwellings Increased risk of extreme weather events to already vulnerable traditional and informal dwellings, that are often unplanned, and without extensive service or infrastructure. 25 Increased isolation of rural communities Physical isolation of rural communities as a result poor rural roads and increased flooding and erosion. 26 Increased migration to urban and peri-urban areas Increased migration from rural settlements to urban and peri-urban settlements. 27 Increased risk of wildfires Increased risk of wildfires linked to higher ambient temperatures, dry spells and more frequent lightning storms. 28 Decreased income from tourism Reduced income from tourism as a result of reduced recreational opportunities and increased impact on tourism-supporting infrastructure, such as conservation area access roads. 29 Decreased quality of drinking water Deterioration in water quality due to increased salt concentrations in dams, wetlands and soil/plant systems from enhanced evaporation rates. 30 Decreased water quality in ecosystem due to floods and droughts More frequent floods result in increased effluent overflow into rivers. Increased drought means less water is available to dilute wastewater discharges and irrigation return flows to rivers. 31 Less water available for irrigation and drinking Increased periods of drought mean less water is available. 32 Increased impacts of flooding from litter blocking stormwater and sewer systems Human health and ecosystem impacts, associated with increased rainfall intensities, flash floods and regional flooding resulting in litter and washed-off debris blocking water and sanitation systems. 33 Increased fish mortality Increased freshwater fish mortality due to reduced oxygen concentrations in aquatic environments and mortality of temperature-sensitive fish species. Exposure is usually scored using a yes/no answer. If we consider an example indicator from the human settlement sector, Increase impacts on Informal Dwellings, for exposure we would ask the question: “Do we have informal dwellings in the area?”. The answer to the exposure question can be determined using resources such as the RVCC Data website or other related reports, and our general knowledge of the area. Sensitivity is usually scored using a high, medium or low rating. 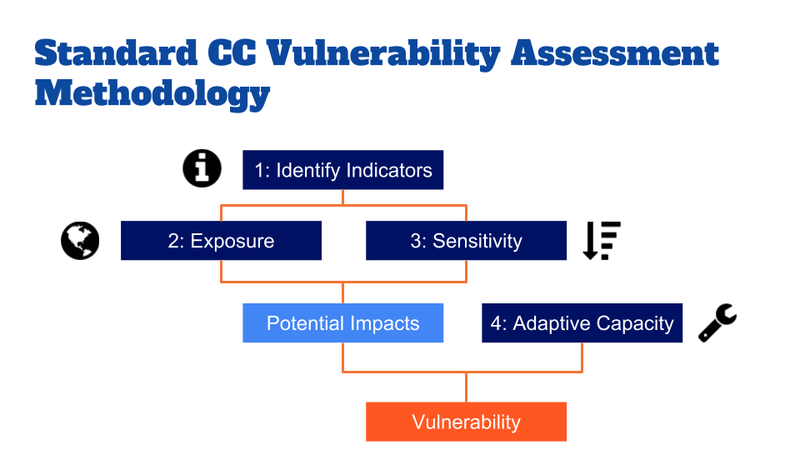 In the Vulnerability Assessment Tool, each indicator has a proposed way of scoring sensitivity as high medium or low. If we consider an example indicator from the human settlement sector, Increase impacts on Informal Dwellings, for sensitivity we would ask the question: “What percentage of households live in informal dwellings?”. The answer to the sensitivity question may require more recent statistics and local knowledge. The fourth step in the climate change vulnerability assessment refers to the concept of “Adaptive Capacity”. Now that we know what the list of all potential impacts are (Step 1), whether or not we are exposed (Step 2), if we are exposed how sensitive is the issue (Step 3), we need to determine whether or not we have the systems in place to respond to the climate change impact. Do do this, we can ask the question, “Do I have systems in place to respond to the impact?”. Is there local research on the particular climate change risk (e.g risks to traditional and informal dwellings)? Are there robust policies & programs in place to deal with the particular climate change risk (e.g risks to traditional and informal dwellings)? Are there institutional systems to deal with the particular climate change risk (e.g risks to traditional and informal dwellings)? Is there financial support for the particular climate change risk (e.g risks to traditional and informal dwellings)? Is there adaptive capacity within the community to deal with the particular climate change risk (e.g risks to traditional and informal dwellings)? The Adaptive Capacity score is a summary of average High, Medium and Low scores of this different questions. Climate Change Vulnerability Assessment A methodology used to help determine the most important climate change impacts for an area.